Welcome to this blog! If you enjoy reading it, you can leave a comment and sign up as a follower. 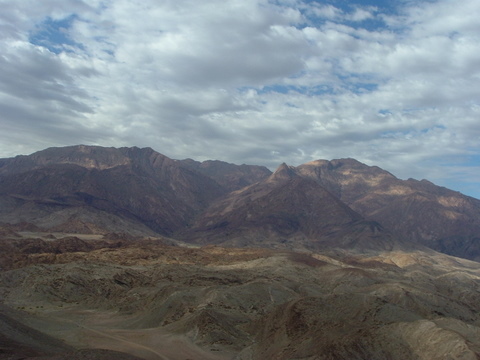 A Mineral specimen blog by which we want to share our mineral outings as well as our experiences in the Western Cape mountains. About three weeks ago Pierre and I drove out to a farm, quite some distance outside of our home town, Ceres. This year Spring came quite late, but in full splendor. It was a beautiful, sunny day, and sheer bliss to be outside, drinking in the quietness of our tranquil surroundings. This color combination in flowers is not so common. Although we found only a few crystals, we had a most enjoyable day, and even had the privilege of seeing a Blue Crane dance with outstretched wings. Unfortunately, by the time I had our camera ready, the dance was over! They were quite some distance from us, so I had to zoom in the camera to photograph them. The Blue Crane is South Africa’s national bird, and is currently on the list of vulnerable species. Until several years ago, it featured on South Africa's 5c coin. For that reason I often referred to these birds (especially when speaking to my children) as 'the 5-cent birds'. The Blue Crane is South Africa's national bird. 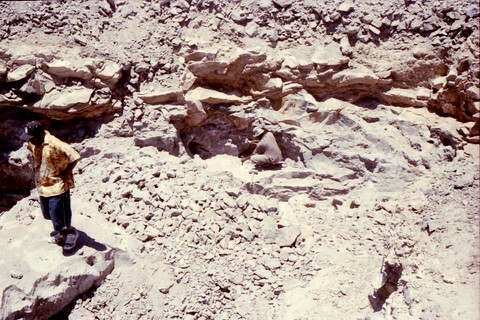 While looking for possible crystal deposits, Pierre came across a snake, which was lying motionless on the hard ground. It was so well camouflaged, he could easily have stepped on it! It was a horned adder. Fortunately for us, the soil was very hard, because these snakes often wiggle themselves down in loose, sandy ground, until they're just beneath the surface and virtually unseen, where they can lie waiting for their prey! Pierre pinned it down with a stick, then took hold of it behind its neck to have a closer look (when he was younger, he often caught snakes as a hobby). I was quite a distance away, so he called to me to bring the camera. It moved its head around quite a bit - the exposed fangs moving very close to Pierre's fingers - too close for comfort! So he put the snake down again, and restrained it with the stick until I got there, and we could take some photographs. After a successful photo session, he released it into the field again. Pierre pinned down the snake with a stick. The horned adder at a safe distance. ... posing for a photograph, head twisted back towards its tail, showing its red tongue. Many flowers grow in seemingly barren ground. Close-by, there is lush growth. We found some crystals, and a few pockets that were nicely encased in large rocks, so we only photographed them, and did not attempt to remove any of these. They were prettier there, in their pockets, than what they'd be as single, removed crystals. Some crystals looked better, just left in their pocket. I found a small pocket with crystals that I thought were part of a cluster, but as I gently worked the soil loose around them, I saw that they were all double terminated crystals. Although they were a good size, and with bits of manganese coating, they weren't very clear, but will still look good once we've cleaned them properly. ... a few double terminated crystals, yet uncleaned. Beautiful flowers grow in seemingly barren soil. Succulents growing among bits of quartz rock. We got to a pocket where Pierre uncovered a lovely cluster with fairly big crystals, located about 30 cm beneath the ground surface. In total we spent several hours trying to loosen it, but found it impossible. We gently cleaned away all the (very hard!) soil, but eventually realized that they were set on solid rock, too big for us to get out. So I guess one can say that this cluster was a big one that 'got away'. At least we have a photograph of it, one we took before we realized that we couldn't remove it. Pierre at the pocket that yielded a cluster on solid rock. We came across several strange, reddish plants, many of them growing where there didn't seem to be any plant growth possible. They appear to be some type of succulent and some of them have seeds/flowers that remind me of toenails protruding from an octopus's tentacles ... Some grew on dry, flat soil among other plants, others grew on hard, rocky ground, and some protruded out from rocky, vertical overhangs. South Africa has the largest variety of indigenous wild flowers in the world, and we're privileged to see so many of them in our part of the country. Many grow on hard, rocky ground. Some grow from vertical overhangs. We enjoyed the splendor of all the wild flowers, and there were some patches that had us wonder where to tread, because of their abundance. Although our main aim of the outing had been to find crystals, which this time was not very rewarding, we had a full, lovely day! I hope that you enjoyed our outing with us! My Recent Crystal Collecting Trip up the Mountains. A few weeks ago I started making plans to visit a remote place up in the Western Cape mountains, where I had discovered an amazing source of fine quartz crystals years ago. Due to the steep ascend, careful planning had to be done as one can only carry so much up the mountains: tools, ropes, sleeping gear, food etc.. Finally, on Monday morning 28/05/12, I left, driving the 80 km or so to the farm, with the kind permission of the farmer. 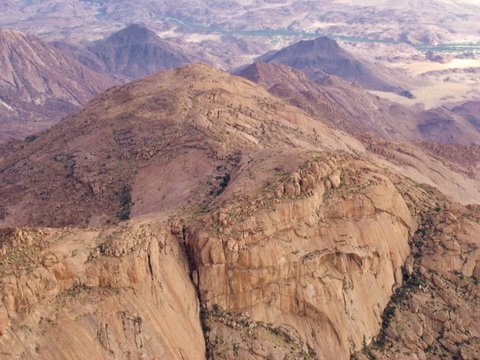 Once at the farm, I drove up to the mountain as close as my little Toyota car would allow, and then hiked up a gorge for about 10 km to a convenient place which would serve as my home base. I arrived at my destination at about midday, rested for an hour or so and repacked my rucksack with only the bare essentials. Once again, I started up a steep slope to a cave which would serve as my second home base. After a very strenuous climb, I reached the cave and, after making myself at home, climbed down a treacherous, very steep ravine, through very dense ferns and shrubs, to fetch some drinking water. I made a welcome fire and after having a meal, sat for hours, just staring at the flames. What a difficult day it had been! My view from the cave. Lovely coals to keep the cold away. Tuesday started out a beautiful morning. I had breakfast and prepared myself for the climb to the crystal destination. An hour or so later, I reached the place that I had come for. 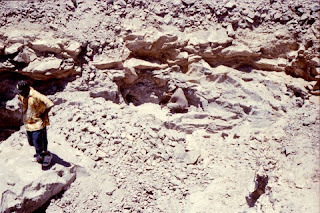 It was a cliff with many small to larger pockets of crystals, as well as a few small caves, which I am certain, have many crystal plates inside. Most of these small caves can only be reached by a very experienced mountaineer (which, by the way, I am not). A few years ago I removed a fairly large pocket at the foot of the cliff and I hoped to find a few more specimens there. I did find some more, but not nearly as much as I had hoped for. Not far away from this, now empty, pocket, I found the remains of a leopard kill, in this case, a rock rabbit. From there I walked about 30 m to a small cave (accessible and just big enough to sit in) and started removing a heap of rock rabbit dung, rotten vegetation and soil at the bottom of the small cave. Suddenly I found a loose crystal, then another and another ... and then the first plate of crystals. Before long, I had far more than I could carry and there still appeared to be many more. I wrapped what I intended to carry down, with the largest plate about 20 cm long. Due to the steep decline, I only took about 7 kg of crystals and as it was getting late, I started off back to the cave. The trip down was very difficult and rather dangerous. One slip, and you could lose far more than crystals. I reached the cave just before dark, and after unpacking, made a fire and had supper. Once again, I sat in front of the fire for a good while and thanked my heavenly Father for protecting me and allowing me to remove such beautiful treasures of nature. That night I slept much better than the previous night. A small cluster of quartz crystals, fresh from the earth. A pocket of crystals - one of many - beyond my reach. Wednesday morning was yet another beautiful day, with a few clouds that disappeared later on in the day. Then I had a problem. 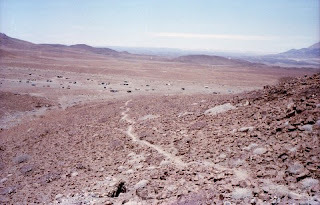 To walk down a very steep slope with about 25 kg of weight, was nothing to look forward to, especially not if there were sections of loose rocks to negotiate. Everything progressed fine and after a difficult, but successful walk, I reached the home base. I washed in a river that flowed close by, and had something to eat and rested for a while. About 10 minutes away (an easy walk) was yet another crystal deposit beneath a small cliff, where we have found many lovely crystal specimens over a number of years. It wasn't long before I reached this familiar and welcome site. I spent the rest of the day working through a heap of loose rocks and found many single crystals and two nice small clusters. Back at home base, I once again made a fire and after having had supper, enjoyed a welcome cup of coffee. I sat next to the fire until the coals had all turned to ashes, then climbed into my sleeping bag for a very welcome and much needed sleep. Thursday would be my last day of digging and I planned to take it easy and take what I could get. It ended up being a really successful day. I discovered a small, but high quality, pocket of small plates of quartz crystals, as well as another small pocket of well formed single crystals, all loose. I thoroughly enjoyed removing these lovely treasures and took what I could carry and left the rest for next time. Back at the camp, I sorted my baggage out and placed all the wrapped crystals (some 12 kg), tools and other things that I would not need again, in my rucksack and carried it halfway down the gorge. I did this because I feared that the weight would be too much for me the next day. The total weight of my bag was about 42 kg. When I arrived back at camp, I made supper and this time I sat next to the fire till the last heat of the coals were gone. It had been a good day and would be the last night's sleep. A stunning large cluster waiting to be removed. A few loose crystals with two of them partially cleaned. A few of the single crystals, cleaned. The next day I rose early and hiked down to where I had left the rest of my crystals, tools etc.. After loading it into my rucksack, I walked down, carrying 42 kg on my back. I must say, I was very pleased to see my car in the distance and even more so upon reaching it! Not too long afterwards, I was home safely, with Riana waiting for me with a nice, home cooked meal. All in all it had been a tiring, bruising, but very fulfilling trip. I am grateful to my heavenly Father. The quietness of unspoiled nature, with the only sounds being that of running water, birds and rock rabbits, is very, very rewarding on its own. Add to that a few crystals and last, but not least, a gratitude towards God for the privilege of being able to enjoy all that. When I do get the chance to clean some specimens, I shall add a few more photos. Some specimens clean easily, whilst others may have to soak for weeks. Thank you for taking the time to read this entry. I hope that you enjoyed the journey with me. 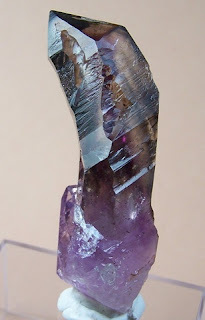 Please visit our website http://www.namibianbrandbergcrystals.com to view numerous Brandberg mineral specimens and crystals. 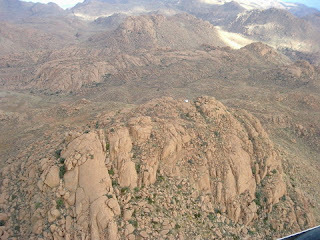 It is commonly accepted that the most beautiful quartz and prehnite specimens come from the Brandberg and nearby hills. Lately topaz, in a variety of colours (some weighing several kilograms) have been discovered, as well as aquamarine and tourmaline. In addition to these, beautiful calcite, epidote, green garnet and a number of lesser known mineral specimens are found in the immediate vicinity. Even though the Brandberg mineral specimens are fairly well known, I do not think that most people have fully come to realize just how special they really are. I have seen quartz specimens from all over the world and even though there are many really nice specimens, none can match the best from Brandberg. 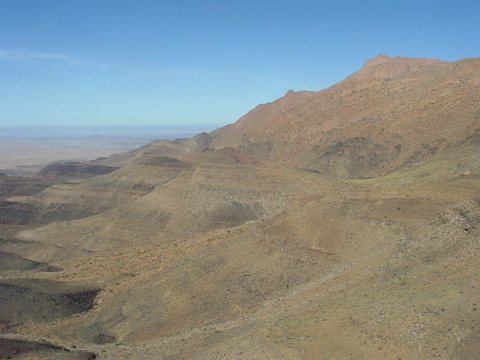 The Brandberg area is quite a vast area and in this article I want to concentrate on the South Western side of the Brandberg where the quartz, prehnite, calcite and epidote specimens are mined. 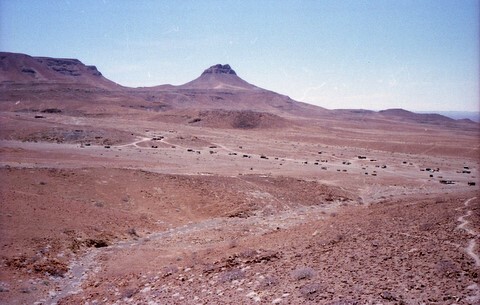 This area, a range of hills and small mountains, are known to collectors as Tafelkop and Goboboseb, and lies about 15 km from the Brandberg itself. 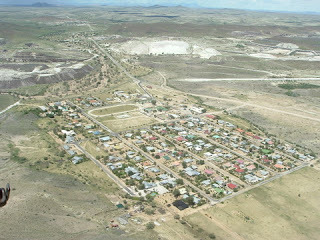 The closest town, about 80 km to the Eastern side of Tafelkop, is a small mining town called Uis (the Damara word meaning 'bitter water', referring to the quality of water at Uis). 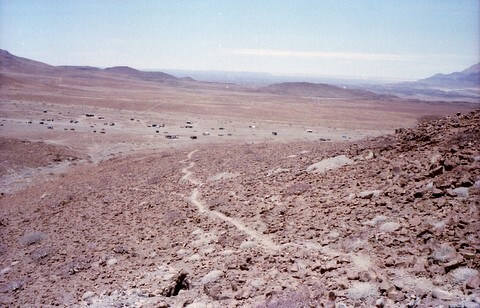 The road from Uis to Brandberg is a sand road and mostly not fit for standard vehicles. 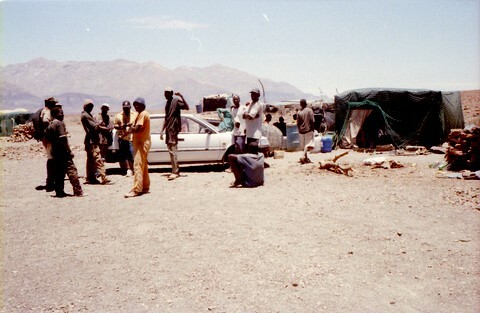 The local mineral specimen miners, comprising of Damaras, Hereroes and Ovamboes as well as a few Europeans, mostly live in Uis and travel to and fro and sometimes live in the desert in makeshift shelters for weeks at a time 'till they have enough specimens to sell, either to mineral dealers or tourists. 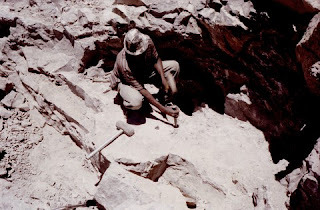 A regular miner, Lori Raaths (the famous Namib cowboy), one of the very first to mine for the beautiful Brandberg crystals, told me that when he started mining the crystals, he found them lying on top of the ground. 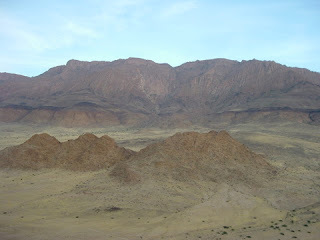 He and his wife, three sons and daughter, lived in the desert for a number of years, but now reside in Uis. When I visited Goboboseb in 2003, there were already over 200 mineral specimen miners just in that area alone. Because of the increasing difficulty of mining in that area, the number of miners have dwindled considerably. Besides the scorching heat (often over 40º Celsius), there is a shortage of water, no guarantee of success (you can mine for weeks without getting anything worthwhile), and the mining method is extreme: 10 pound hammers, large masonry chissels and hard basalt rock. Being a quartz miner myself, I know what drives them. 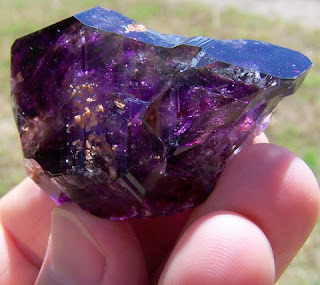 To open a pocket of Brandberg crystals must be an addiction second to none, and you stand the slim chance of finding a pocket of crystals worth several thousands of dollars. I remember one December, while visiting the mining area at Goboboseb, I gave an Ovambo man a lift back to Uis. His foot was swollen from a mining accident. He was discouraged and have been mining for weeks without success. I dropped him off at the clinic at Uis and left. About a week or so afterwards, I had a surprise visit from this very same person. He had quickly recovered from his injury, gone back to the diggings and found a lovely pocket worth quite a few thousand dollars, and that just before Christmas! He offered me some really nice crystals at very good prices. My dollars were getting a bit thin so I bought a few crystals and declined a beautiful large, double terminated specimen that, even though he offered it to me at about half price, was still above my budget. We have since occasionally had the chance to buy really top specimens, but they can be very expensive and we are not in that retail bracket yet. 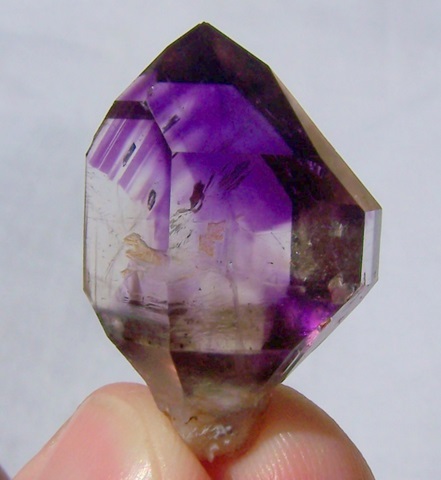 Brandberg crystals of quality, that are large, are rare and usually very expensive. We have seen a few crystals that would easily retail for US $ 20 000 +! Next time when you see a nice quartz or other mineral specimen from Brandberg, and you wonder why it is relatively expensive, you will know that they are not just the best, but are also not easily found. There are a few European miners that are using dynamite and digger loaders, but they are destroying pockets and those quartz specimens that do survive, are often cracked. I am not in favour of this method. Even this method is very costly and, thank goodness, limited. The very first Brandberg crystals that I ever purchased were from a fellow dealer, Reine Ackermann, and I have never looked back. We still get just as excited today while viewing Brandberg crystals, as then. The appreciation of Brandberg crystals and other mineral specimens from this area, should be accompanied by one's appreciation for those who make a living in providing us with these beauties. There are those who exploit these miners, but in doing so they show no respect for these hardworking and often, poor, people. When I first visited Uis, I stayed there for a good while and spent most of my time in the location, befriending the local miners. Getting to know these lovely people, has aided Riana and I in purchasing specimens (which are not always easy to buy) on the last number of visits to Uis. even though it was a very good price, it was outside our budget. Me on the right, with the famous Namib cowboy. 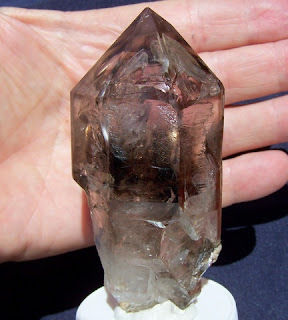 A very peculiarly shaped quartz crystal; part of our personal collection. 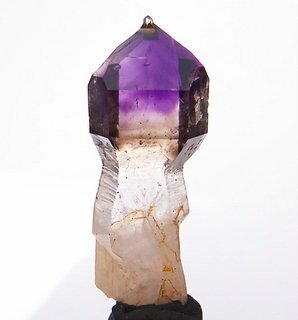 One of our best Brandberg crystals, part of our personal collection. A beautiful large smoky quartz crystal that forms part of our private collection. An aerial photograph of a famous beacon on the Brandberg. 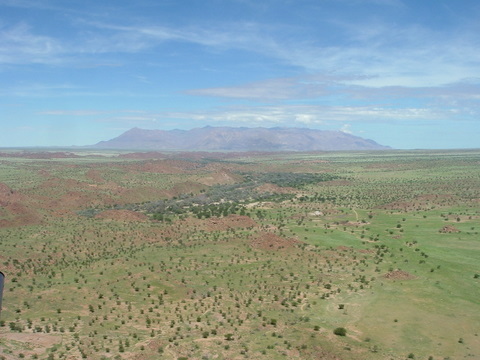 An aerial shot of the Brandberg, facing West. Our Ovambo friend and his brother, digging in the background. 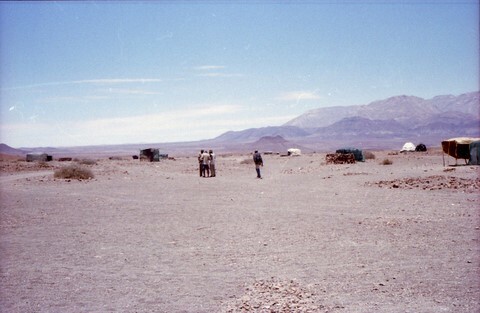 A footpath leads to a mining village at Goboboseb, 2003. 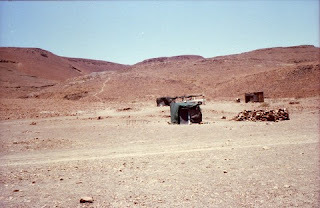 Another shot of a mining village at Goboboseb, 2003. This is how it is done - 2003. A few temporary shacks with the quartz-bearing background, 2003. 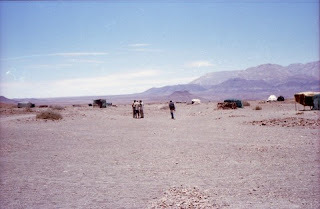 In the mining village at Goboboseb, 2003. 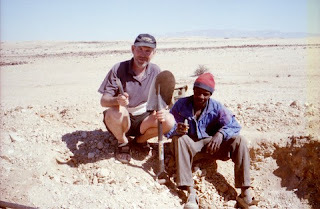 Christmas day 2003, somewhere in the Namib desert, digging for 'music' crystals. An aerial photo of the Brandberg, taken by the late Nico van Dyk. Note the green desert after good rains! An aerial photo of Uis, taken by the late Nico van Dyk. We live in a town surrounded by mountains, streams and farms. We spend a lot of time in nature, often accompanied by our two dogs, both royal pavement specials. I am a handyman, but at the moment I am working on our house and the web-site. Riana has a degree in nursing science, but is not practising at the moment. Digging crystals is a passion that takes us to quiet and beautiful places. I also do trout fishing, mostly in rivers, but have an inflatable boat for mountain reservoirs and dams.